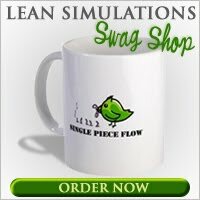 Lean Simulations: What is a Value Stream? In my last post, How to Read a Value Stream Map, I didn't elaborate too much on what a Value Stream actually was. Your manufacturing or business process is a value stream. Your mailman delivering mail is a part a value stream. Any process that delivers value to the customer is a value stream. Before looking at a value stream map, everyone needs to be clear about what a value stream is. This short and simple video does the job. It clearly describes the value stream as all the activities involved in bringing product to your customer, and then focuses on the next step: Identifying what adds value and what's waste. The best part about this video is the animated bar showing the value stream. Some portions are green (they add value) and some are red (waste). As the narrator describes waste, the red bars are removed and the bar shrinks down, reducing lead time and cost. Very smooth and clever animation. I feel like I'm watching my hard drive being defragged (does anyone still do that and who else besides me would get exited about that..). At less than a minute, this video is a perfect intro to your value stream mapping session. Take a quick look and tell me what you think! I've added this video to my free list of lean training videos. Excellent video! Short, visual, and gives a very clear message of what a value stream is. This is lean at it´s best. Thanks. I love the short videos too. Making your audience sit through a 1 hour video explanation of lean is just plain lazy. And you'll lose them. A short video is perfect for introducing or emphasizing a point.